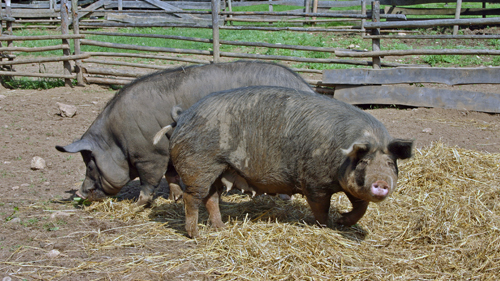 The Berkshire hog was discovered by Oliver Cromwell's army, in the shire of Berks in England. After the war, these veterans carried the news to the outside world of the wonderful hogs of Berks; larger than any other swine of that time and producing hams and bacon of rare quality and flavor. This original Berkshire was a reddish or sandy colored hog, sometimes spotted. This would account for the sandy hair still sometimes seen in the white areas of some modern Berkshires. Later this basic stock , was the only outside blood that has gone into the Berkshire breed within the time of recorded livestock history was a cross of Siamese and Chinese blood. This brought the color pattern we see today along with the quality of more efficient gains. The Berkshire bloodstream has been pure for 200 years now, as far as the records are known today. The excellent carcass quality of the Berkshire hog made him an early favorite with the upper class of English farmers. For years the Royal Family kept a large Berkshire herd at Windsor Castle. A famous Berkshire of a century ago was named Windsor Castle, having been farrowed and raised within sight of the towers of the royal residence. This boar was imported to this country in 1841, creating a stir in the rural press that has seldom been equaled. From these writings, it appears that he must have weighed around 1,000 pounds at maturity. His offspring were praised for their increased size, along with their ability to finish at any age. In 1875, a group of Berkshire breeders and importers met in Springfield, Illinois, to establish a way of keeping the Berkshire breed pure. These agricultural leaders of the day felt the Berkshire should stay pure for improvement of swine already present in the United States and not let it become only a portion of the "Common Hog" of the day. On February 25 of the same year, the American Berkshire Association was founded, becoming the first Swine Registry to be established in the world. This society drew forth an enthusiastic response from men working with the breed both in this country and in England. 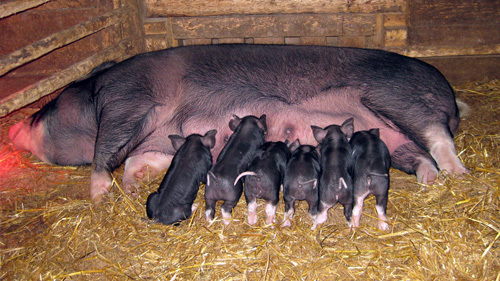 The first hog ever recorded was the boar, Ace of Spades, bred by Queen Victoria.